Kusina at Hilton Manila serves Filipino favorites like kilawin and crispy bagnet. 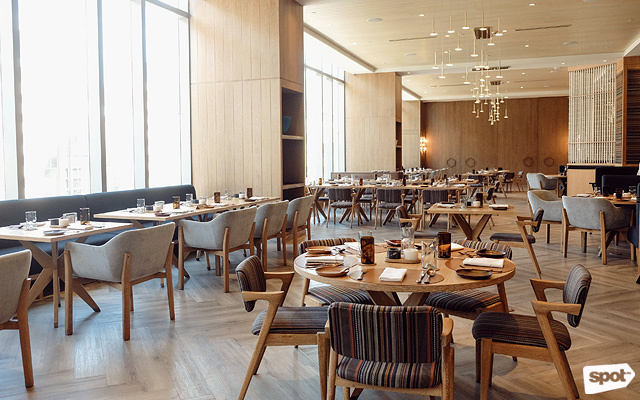 Hilton Manila's Kusina has a spacious dining area to accommodate hotel guests. 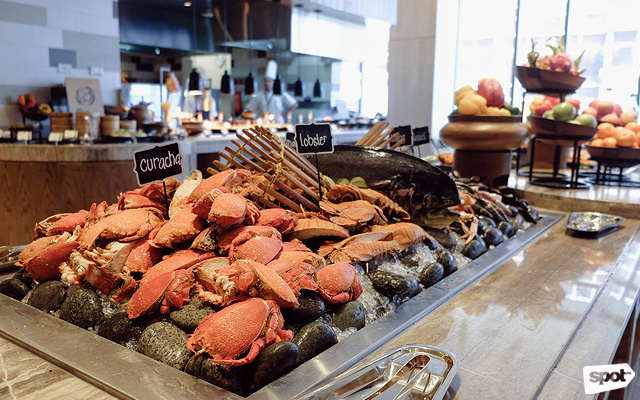 The buffet has a fresh seafood station where you can sample a wide assortment of fish, mussels, crustaceans, and more. It can be said that the Filipino home revolves around the kitchen. Thus, everything about Kusina revolves around Filipino food and tradition that stands on its own in the culinary world. With high ceilings, the airy interiors of Kusina evoke warmth and hospitality, reminiscent of entering into the familiar and spacious Filipino home of someone you love. The theme of Kusina is Filipino-inspired, with indigenous fabric accents, local pottery, and lots of wooden décor. 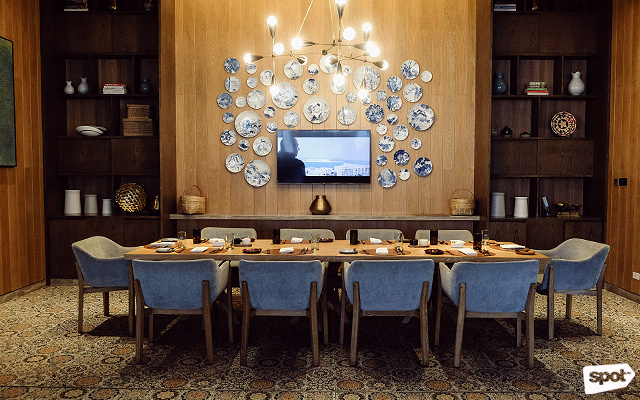 The restaurant has touches of indigenous handwoven fabric on the chairs, distinctive handmade stoneware from Antipolo by Lanelle Abueva-Fernando, and as an ode to the earth-friendly, upcycling movement that Hilton Manila is very much a proponent of: repurposed wine glasses from recycled wine bottles. They are a regular part of the 180-seater restaurant, as well as placemats made with recycled leather and old rubber tires. Eco-sustainability is not just a design element, but is very much the love language here. Kusina wants to share the typical Pinoy eating experience with their guests, from crowd-favorite street-food selections, to ordering fresh seafood at the talipapa. Start off your buffet experience with Kusina's samalamig selection. They even have a panaderia for your local-bread fix! If you're wondering—yes, they have international bread, imported cheese, and cold cuts, too! 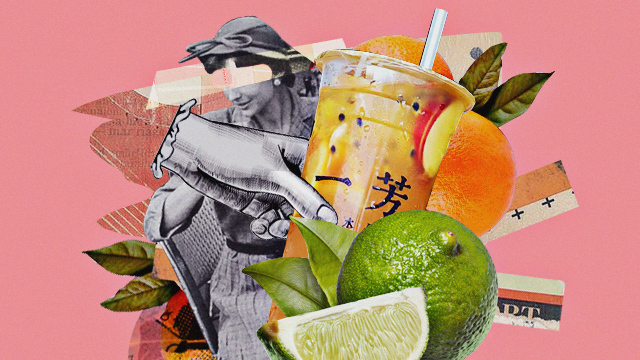 Entering Kusina, you are greeted by the Samalamig (local refreshments) station where, reminiscent of how Filipino street vendors sell their cold drinks, various thirst-quenching options like fresh buko, mango sago, fresh pandan, and four seasons are in a colorful, refreshing row. The Panaderia station has local pan de sal, bread rolls, ensaymada, kakanin like puto and kutsinta and international pastries baked fresh daily. 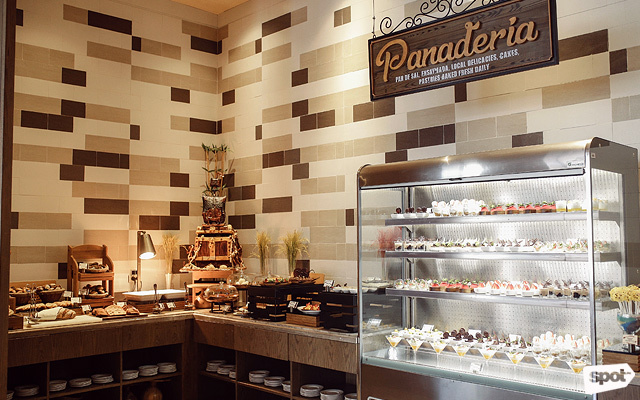 If you catch the daily breakfast buffet, you may even see the roving panadero who walks around the restaurant with a warm basket of freshly baked pan de sal. It's not often you see Pinoy street food at a hotel buffet. Kusina has isaw, pork barbecue, and even kwek-kwek. 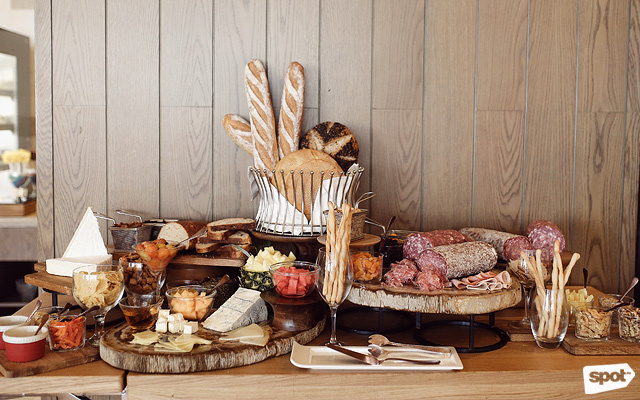 This buffet is a haven for grilled-meat fans! Pick your preferred protein and they'll cook them for you. 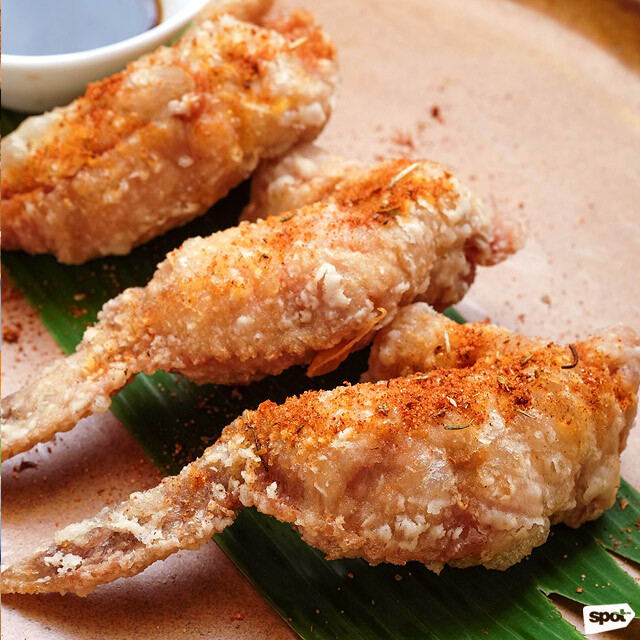 These chicken wings are stuffed with local prawn for an unexpected twist. 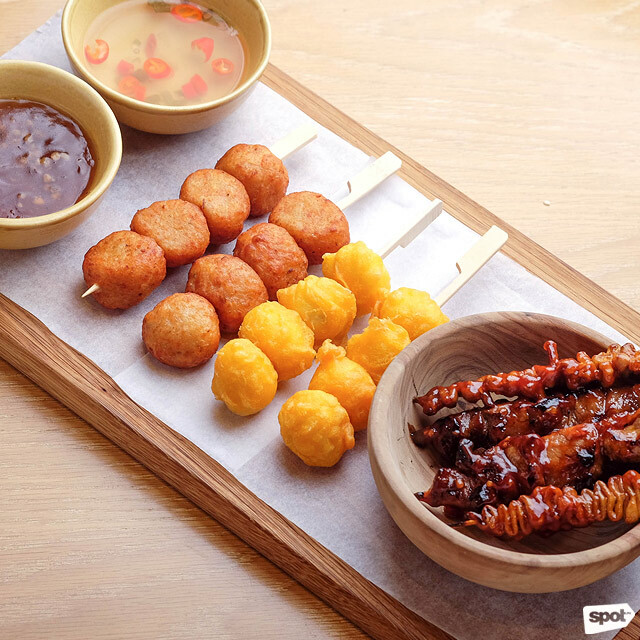 For guests who don’t have the time or energy to experiment with the food finds on the streets of Manila, Kusina has their own version of the Filipino Street Food Taster (P450) with isaw, pork barbecue, chicken skewers, fish balls, and kwek-kwek, all prepared in-house with sawsawan also made from scratch, not to mention Kusina’s own version of Pinoy banana ketchup. Filipinos love chicken wings as an appetizer and Kusina’s take are the Stuffed Chicken Wings (P500), which have pork, chicken mince, and local prawn stuffing mixed with fresh herbs and shallots that have been sautéed in butter and folded with whipped cream. After a coat of potato flour and a quick fry with a spicy Cajun rub, the wings are served with Chinese red vinegar. This might be one of the freshest kilawin dishes you'll have, as far as hotel buffets go. Don't miss the curacha, a tried-and-tested delicacy! Fun fact: This crustacean is endemic to Philippine seas. 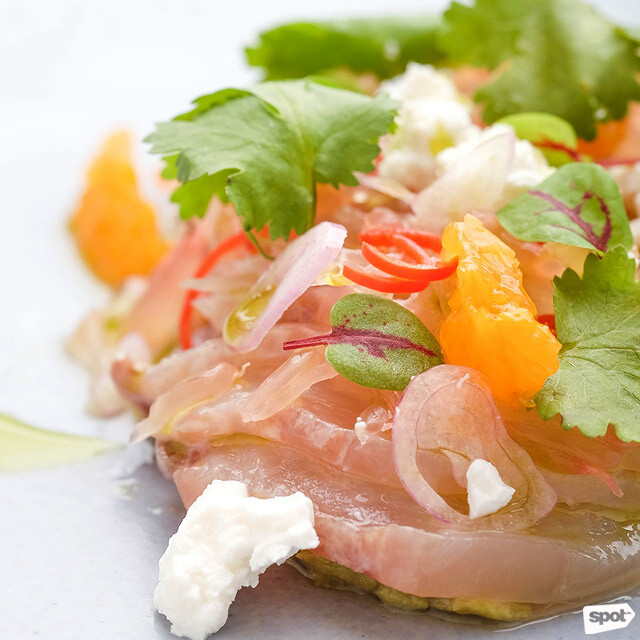 For ceviche lovers, the Tanigue Kilawin (P380) is a simple dish with a citrusy, pungent punch. It has local tanigue on a bed of avocado purée, calamansi juice as the souring agent, and chèvre (or goat’s-milk cheese). Adding to the acidity is chili skin with no seeds, pomelo, and it also has coriander and extra virgin olive oil. This intensely flavored small plate would start off any meal quite nicely. 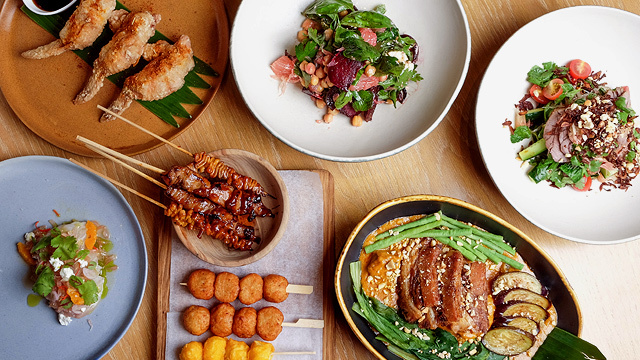 Classic Filipino main-course favorites like crispy bagnet, which crackles with each savory bite, lechon paksiw, ginataang alimasag, and chicken afritada are a few of the rotating dishes in the mains section. 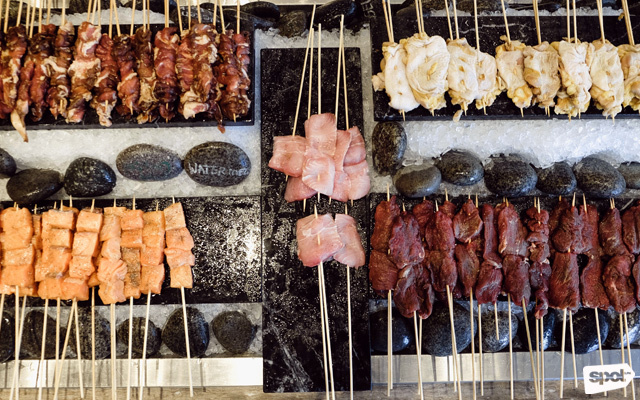 There is also a Grilled Food station where freshly prepared skewers of chicken inasal, pork barbecue, mahi-mahi, and salmon are conveniently laid out for one’s grilled-food fantasies. You shouldn't leave without trying Kusina's kare-kare, which Chef Leslie says is the main event. According to Chef Leslie, the star of the show at Kusina would have to be the Kare Kare (P700) with a sweet-savory peanut sauce, oxtail, beans, okra, pechay, eggplant, garlic rice, and shrimp paste on the side. 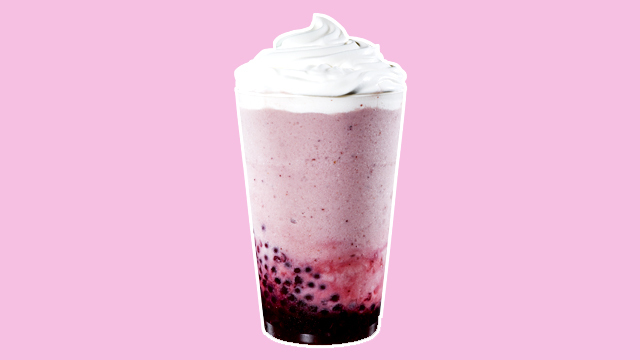 Here’s a secret: It might just be as good as your mom’s. 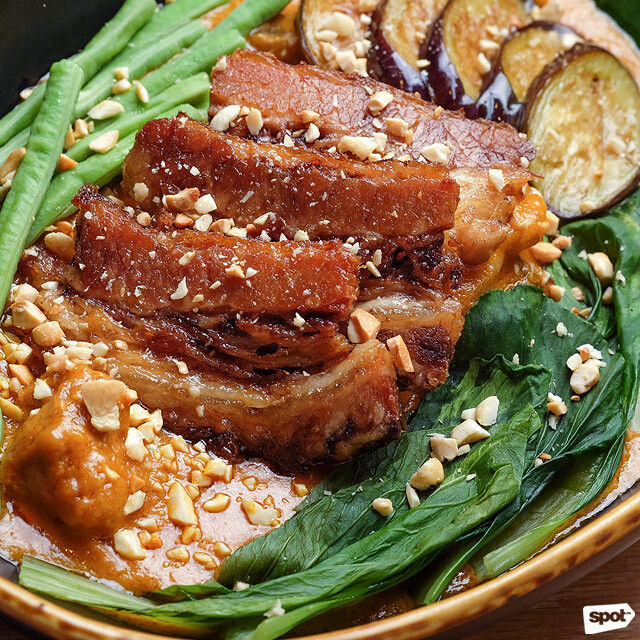 Everything in Kusina’s Kare Kare is meticulously made from scratch: The in-house stock from the beef that’s braised in their kitchen, the annatto oil and the fresh peanuts that are ground daily for the sauce that is thickened with fresh toasted rice. The bagoong is sourced from a local supplier that does not use any preservatives or MSG. And like all the Filipino dishes on Kusina’s menu, the Kare Kare is cooked the traditional way, evoking tastes and flavors of familiar Pinoy food that always reminds one of the comforts of home. How could you not get lobsters? 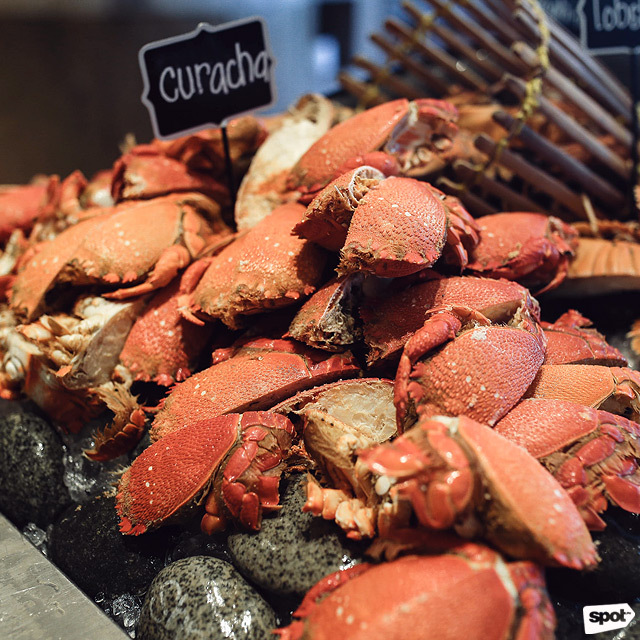 But it is in the Dampa Paluto/Seafood Market (Sea Kitchen) station where Kusina really shines in the culinary sun, with its selection of Filipino food specialties that can whet one’s appetite. The Talipapa (Fresh Market) is where you'll find fresh local catch, with diners having the option of choosing your own mussels, ulang (giant freshwater shrimp), squid, mahi-mahi, or lobster to be prepared in any way you like: Grilled, baked with cheese and garlic, pan-fried with butter; your imagination is the limit. 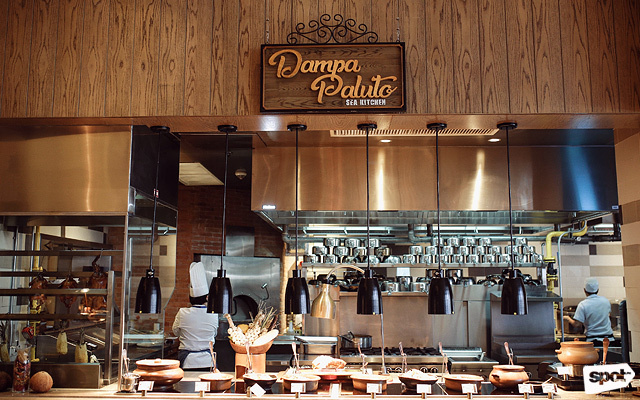 Their Dampa has a wide assortment of seafood, cooked to your liking, paluto-style. 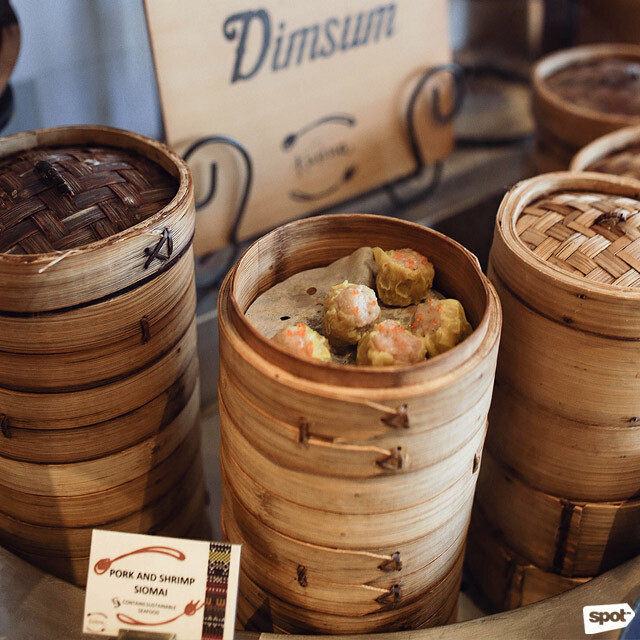 They also have a dim sum cart! For the health-conscious eaters, check out the Fresh Lumpia, Kinilaw at Iba Pa station, as well as the Salad Bar and Japanese Sushi Station. 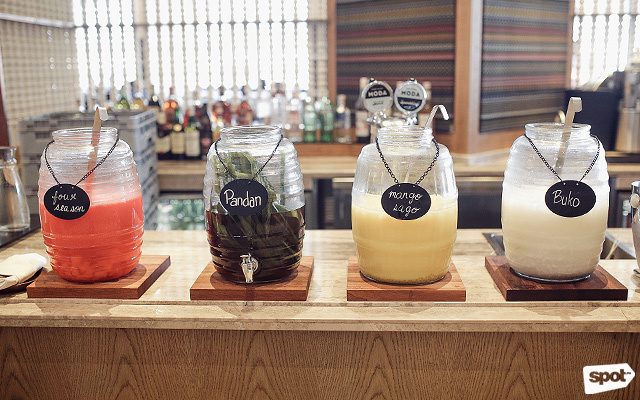 In support of an eco-conscious lifestyle, ingredients are sourced from local farmers whenever possible. 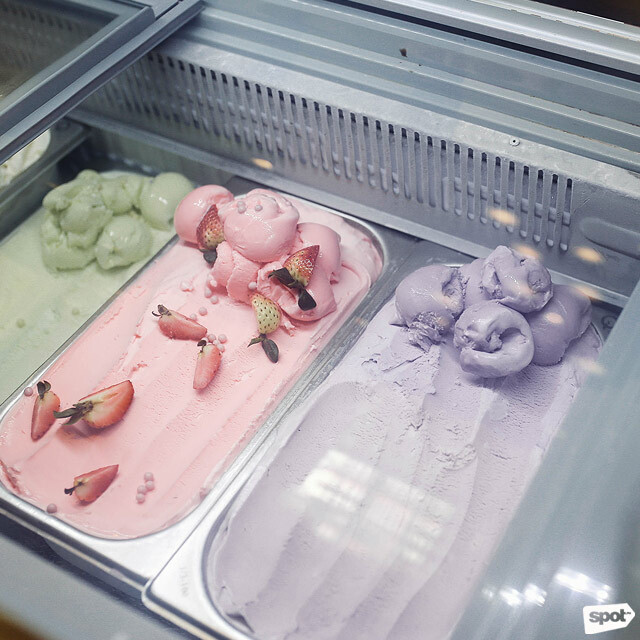 To sweeten the whole Pinoy feast experience, the “Dirty” Ice Cream Cart with various local flavors like Ube, Strawberry, and Pandan is parked beside the Bibingka and Puto Bumbong station. No need to wait for the Christmas holidays to eat these two favorite Simbang Gabi staples. Ensuring that Filipino food stands side by side with the best of global cuisine, the International Kitchen station has favorite main dishes from around the world, like Roasted Beef, Thai Stir-Fried Chicken, Beef Rendang, and Fish Curry, among others. 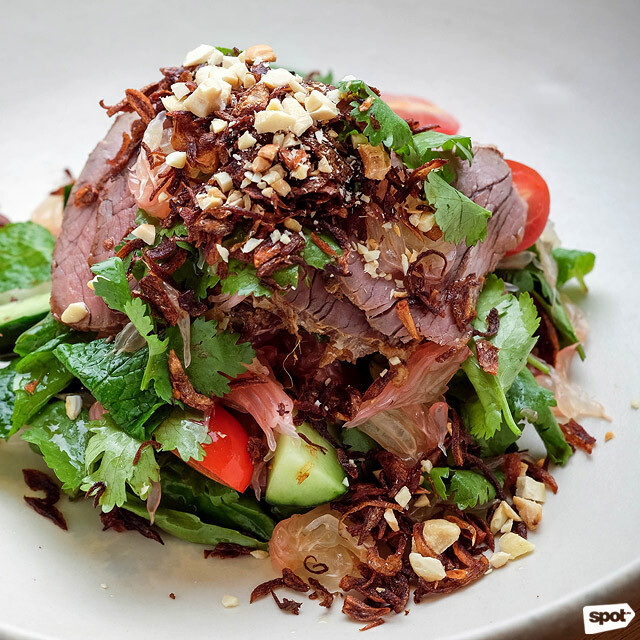 Kusina's Thai Beef Salad is a showstopper, with Australian beef and lots of Thai spices. If à la carte is your preference, you can also order the Thai Beef Salad (P700) with char-grilled Australian beef fillet that is marinated with Thai spices like galangal, shallots, garlic, chili, and coriander root, before being slow-cooked to tender perfection. The local cucumbers, tomatoes, pomelo, and crispy shallots make a perfectly balanced base for the meat, accompanied with the house-made Thai dressing. Even the most serious carnivore would want to give this beetroot salad a try; the vibrant colors are just appetizing. 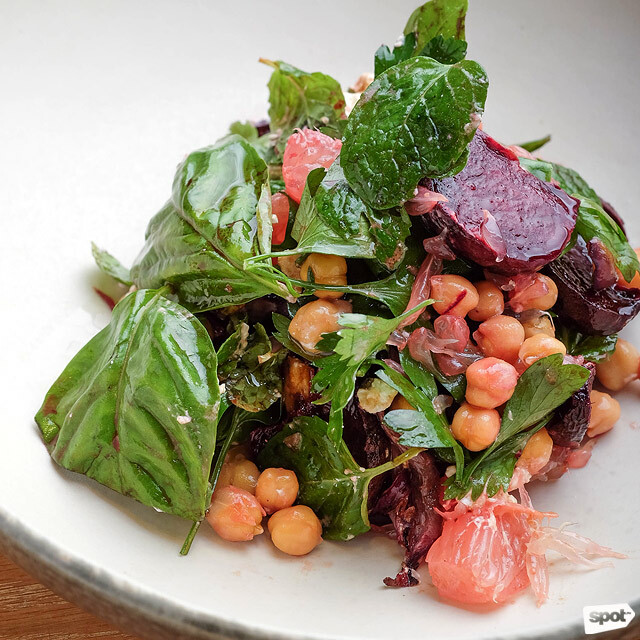 For veggie lovers, the Roasted Beetroot and Chickpea Salad (P680) is a refreshing choice with pomelo, pomegranate, Danish feta, mixed fresh herbs of mint, basil, and flat-leaf parsley, roasted red onions with extra virgin olive oil, all tossed in a vincotto (cooked wine) dressing. The dark, sweet, and syrupy consistency of the vincotto lends a lovely prune-like flavor, enhancing all the fresh flavors of this healthy salad. They've also got a ramen station for your noodle-soup cravings. 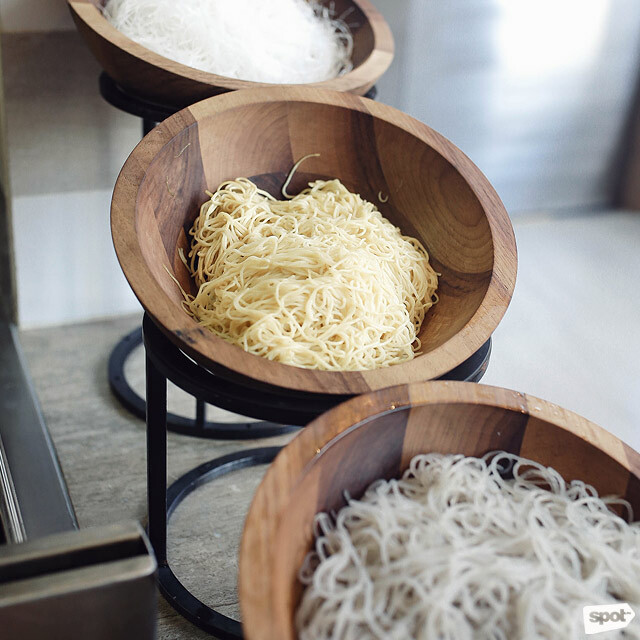 What's a ramen station without a great selection of noodles? 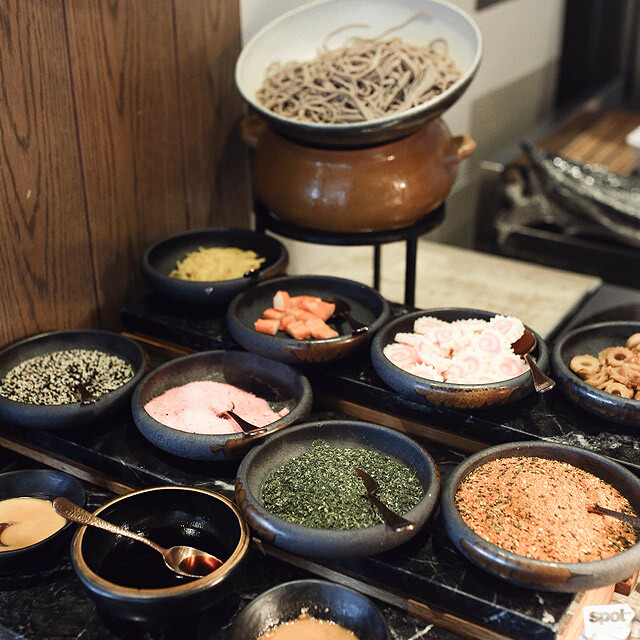 The Noodle Station (Pho, Ramen, Laksa) is where you can concoct your own top secret-recipe noodle dish from an assortment of Asian noodles, house-made soup bases, and fresh condiments. 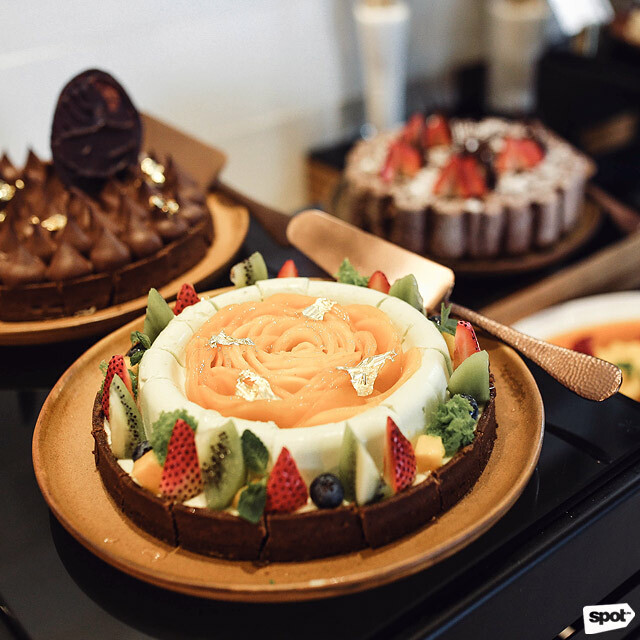 “We don’t use any MSG in the entire hotel; everything is from scratch. From our stocks, our soups, our sauces. It’s all about teaching our chefs to use and develop their skills to make sure they are producing top-quality food, so nothing comes out of a packet,” shares Chef Leslie. For your next Filipino-food craving, it’s nice to know that there’s a friendly Kusina that you can count on to have your old-time favorites done right. Kusina’s Monday to Thursday lunch buffet is at P2,200 while the dinner buffet is at P2,395. Friday to Saturday lunch is at P2,700 and dinner at P2,700. 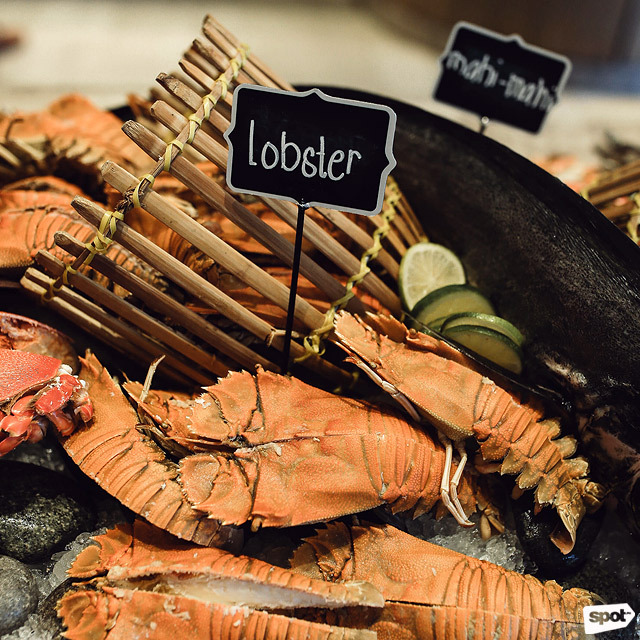 Sunday Brunch is at P2,700 while Sunday dinner is at P2,395. All buffet prices are inclusive of government taxes.